An exclusive 5-star country house with luxury catered accommodation for up to 14 guests. 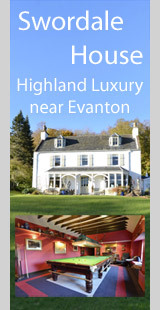 VisitScotland 4-star licensed guest house accommodation on the shores of the Cromarty Firth in Evanton. Superb luxury sporting lodge, and 3 other holiday properties in the beautiful private grounds of the estate. 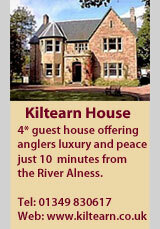 Self-catering accommodation for up to 7 guests within 2 miles of the Novar beats on the River Alness. Luxurious self-catered country house sleeping 10. Two traditional stone cottages, just a few minutes walk from Tain town centre. Stunning modern holiday cottage, 5 mins from the River Alness. Sleeps 4. A guest house in the nearby town of Alness. A very comfortable self-catered holiday cottage, just outside Evanton that sleeps 8. New club website including information on visitor's permits. Information resource for salmon and trout fishing on the River Conon system. Information regarding the work of the Cromarty Fisheries Trust on the Association of Scottish River and Fishery Management Trusts (RAFTS) website. 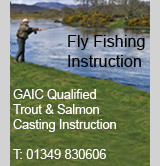 Guided Fly Fishing Experiences, Instruction, Fly Fishing Holidays and Short Breaks.